Oil, the engines life blood. In a high performance car like a Nissan Skyline GT-R, it is a good idea to have a regular oil change schedule, and stick to it. Some people say every 3,000 miles, or every 6 months. Some push the changes out to more than that. For any car you are going to run at the track, it is always a good idea to change the oil before and after every track day. Cheap insurance. That blue end, that is an oil filter. Oil - 7.5W-30 recommended in Japan(R32). 4.5 liters in the pan, 0.4 liters in the oil filter. A good 10-30W synthetic is a start for a street car. Oil Change/Filter change. Keep it happy. We have used Redline 15/50w or 10/30w full synthetic. We are on Royal Purple now, and seems to be working well for us. 4.5 liters, stock. Filling it to the bump on the dipstick is generally considered acceptable. There are some crazy oil guys out there. Check Bob is the Oil guy if you want to go oil nuts. Engine oil, and gear oil viscosity is based on ambient temps. This is the chart from the R34 GT-R service manual, but will work for R32, and R33. Tools - Getting at the oil filter on an R32 GT-R with Hicas can be a trick. It is under the collector. Between the Hicas lines on the frame rail, and the various coolant and air lines under the collector, getting at the oil filter can be a bear. We recommend you buy a 3 claw oil filter wrench. Sears/Craftsman have them. They are about $15-$20 and will get the oil filter off about 99% of the time on an RB26. Some people use a screwdriver to stab the filter if they can't get it off. While it can work, it makes a mess, and if you do it wrong (we have seen it done wrong), you can end up with a nub of a very stuck oil filter. A strap wrench is possible, but again not a lot of room to swing any tools under the collector. Oil filter pliers, same deal. In real life all oil filters would be 1/4 turn past hand tight, but even then they can still be difficult to take off. 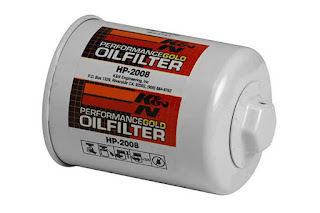 The K&N HP 2008 oil filter has a 1" nut on the end that makes removal a bit easier. It also has a provision to safety wire the filter in place. Most people wouldn't safety wire/lock wire their filter in place, but in the race world, it is a great idea. Other Options - An oil filter relocation kit is a popular way to make oil changes a little easier. There are a number of ways of doing it. If you are putting a relocator, we highly recommend an oil cooler at the same time. The OEM filter is a 3/4-16 thread. Some oil filter relocations change the filter thread pitch, so make sure you check the instructions before you buy a gross of oil filters.